Living under thatch, a risky business? Not really… I imagine more thatch roofs in Britain, were lost to neglect than have ever been lost to fire. 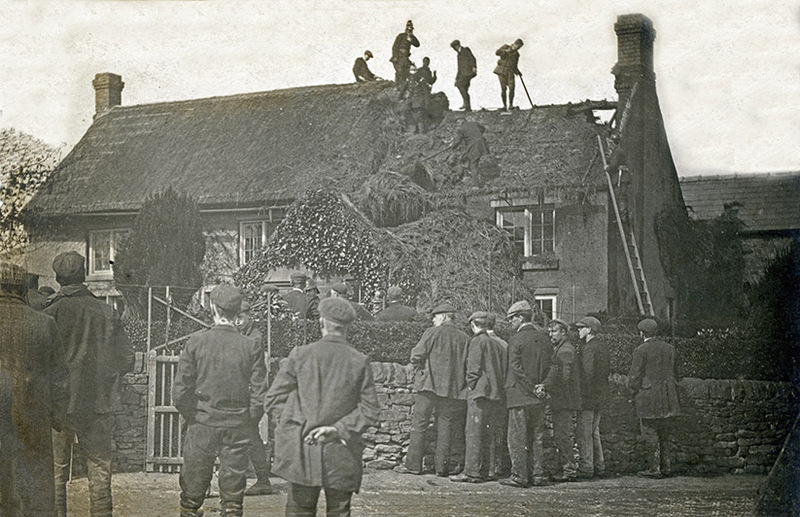 But the illusion remains, that thatched roofs burn frequently and the occupier will soon be out of house and home… In fact there is no more risk, of a thatch roof burning, than a slate or tile one… Insurance company records, over two centuries, have proved this point. The reason for this is that thatchowners generally, are very aware of where they live and take sensible and simple precautions, against fire… But when fires do occur, they can be rather dramatic and usually make the news. Some hints, on how to avoid this sort of unwelcome publicity, now follow. It’s the more down to earth mishaps that may cause problems and these are very avoidable… The biggest risk lies in the fireplace. 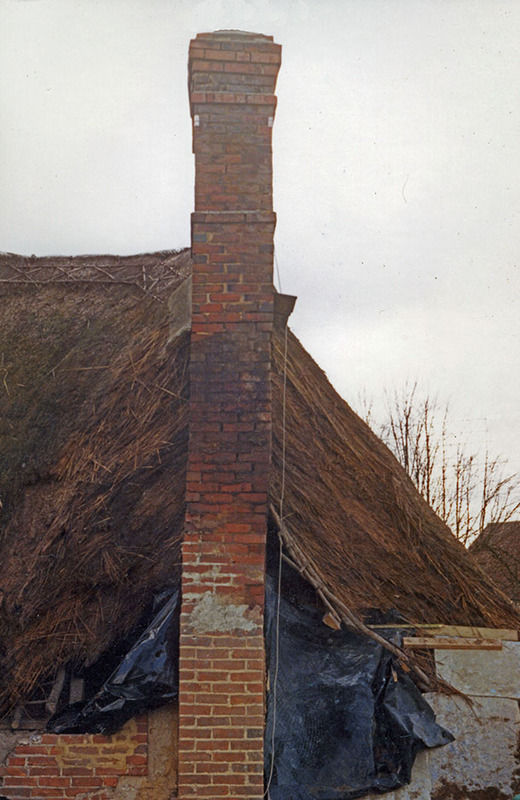 The most common cause of a thatch fire is when the chimney catches fire and leaks into the thatch roof, often through poorly maintained brickwork, as it passes through the thatch, near the ridge. The answer, certainly to the first of these problems, is to have any possible problem chimney lined. There are quite a few systems on the market, which the thatchowner would need to investigate. A good person to get involved is a reputable chimney sweep; who anyway should be employed perhaps twice a year, by the thatchowner, with any form of fire. The best time to fit any lining is when works are carried out to the thatch. As will be seen it is not a good idea to have non thatchers on a roof, if at all possible. The risk of sparks, falling onto the roof, can be lessened; by fitting a spark arrestor. However the problem with these is they get clogged with soot and after a time become a danger in themselves; as the one opposite! The solution is to keep freeing them up; perhaps every three months or so. But that means climbing on the roof; which can mean damaging the thatch…Thatched ridges, over six months old, do not respond well to being walked on… The coatwork is stronger by far, but needs care and experience to climb on. It’s as well to mention here another problem, the thatchowner should be aware of. 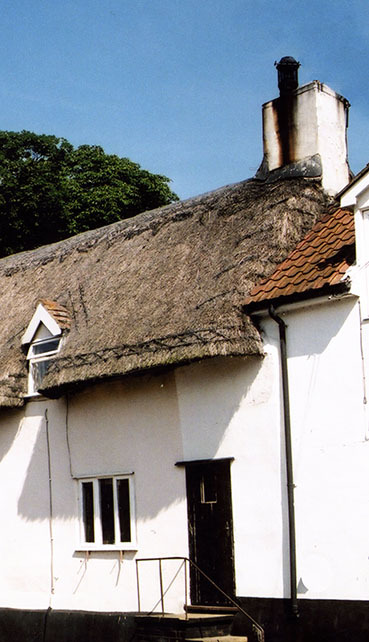 The damage that can be caused by non thatchers climbing on a roof; especially television aerial erectors… Their hooked ladders that work so well on tiled roofs, causes untold damage to any thatched ridge. Wooden liggers will not take the strain, unless very new… If a new aerial is required, try to get it done in conjunction with a new ridge. Better still, try and site it away from the roof altogether. This helps guard against the very small risk from lightening. 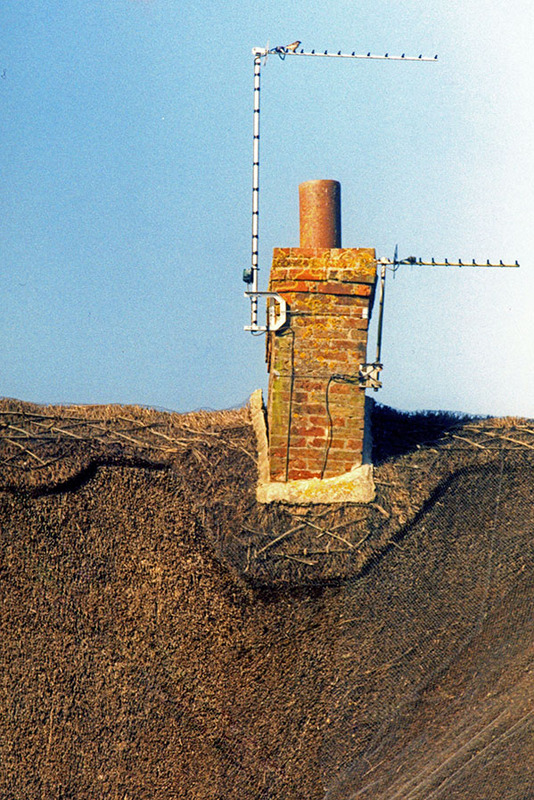 On the right, a nice new shiny aerial… But the wired ridge is now trampled down, around the chimney, pulling the cement fillet away from the brickwork… Time to bring back the thatcher. The risk to thatch from fires, caused by oil lamps and candles has lessened; but their replacement can still cause problems… Electrical wiring has to be kept in good condition. Modern fuse boxes and earth trips are a great help. But the area at risk is in the roof space; any wiring here must be of the highest standard, as mentioned in the Dorset Model guidelines. The main risk, to electrical work in the loft space, are cables being chewed by vermin. Mice and rats can be a nuisance, anything serious is rare. But major problems can occur, on properties that are set into a hillside or bank; or have access to the thatch over extensions. Especially if the property is left unoccupied for any length of time. Apart from any damage to cables, the thatch itself can suffer; as these rodents love chewing through thatch. Cereal straw being favoured over water reed… Private contractors and the local council can provide a lethal solution and they have access to more potent poisons, than are available to the thatchowner. D.I.Y. electricals… Thankfully, most work now legally needs a qualified electrician. The main attraction… These Derbyshire cottages, caught light over a century ago. It seems that the firemen and locals were in much more danger, dancing around on the roof; than this building’s occupiers! It’s almost unknown, for a thatch fire to turn fatal. 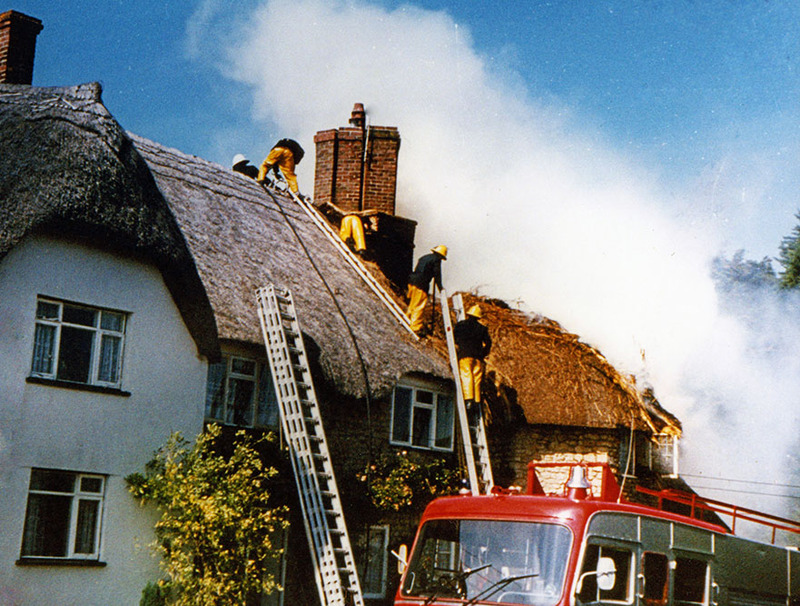 This is a major reason, why modern fire regulations have been relaxed; to allow so much more new building with thatch. All these cautionary tales lead quite logically to the subject of insurance. As well as the internet, in an area with a lot of thatch, there may well be advertisements in the local press, for thatch insurance. Or the owner may be contacted by insurance agents through the post. This goes to show how low the risk really is. These insurers know that and want your business. The premiums are higher than for other properties, but over the years the market has become quite competitive, so it pays to shop around. Owners with a mortgage should beware of insurance tied to the lender. Remember, that with any property insurance, you are insuring against the rebuilding costs and not the market value. The owner should allow for the worst case scenario; clearing the site, a complete rebuild and even accommodation while you are homeless. So it pays not to skimp, on the sum insured…. This 1857 insurance certificate, from Hethe in Oxfordshire, shows how much and how little, has changed in the insurance industry… The value of the insured cottages certainly has altered! Yet the premium, of thirteen shillings and sixpence, is three times the rate for non thatched properties. What the policy calls ‘Doubly Hazardous Insurance’. This is basically, what is often charged today… Which seems a little unfair, as the fire brigade no longer relies on horsepower, to arrive at the scene; or the efforts of sweating neighbours, to power the water pump! 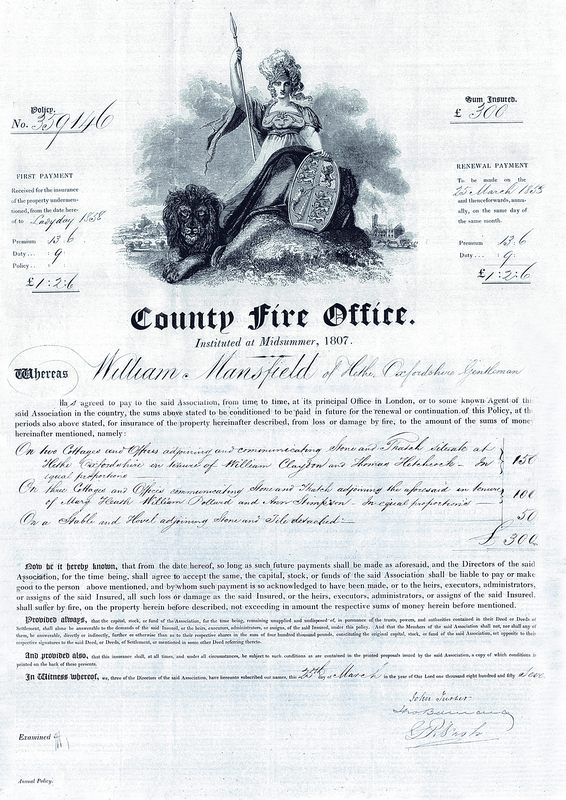 On the plus side, William Mansfield had to pay nine shillings in duty; on his premium. A tax of around 66%. On non thatch properties it was 200%… Which puts any insurance premium tax, we now pay into perspective.